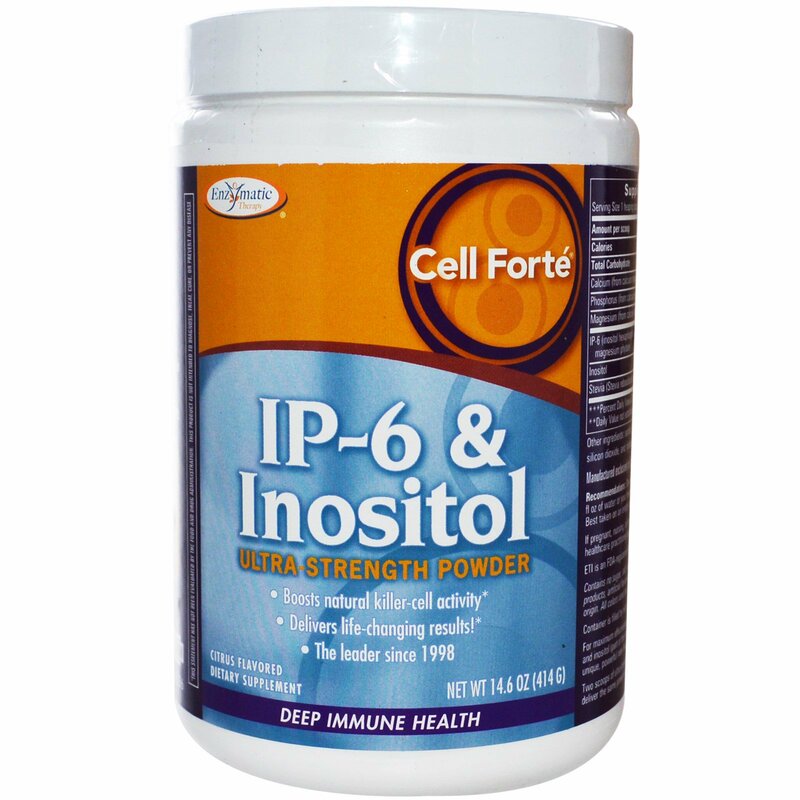 For maximum effectiveness, IP-6 (found in the bran of brown rice) and inositol (part of the vitamin B family) are featured together in a unique, powerful ratio found only in Cell Forte IP-6 & Inositol. Two scoops of ultra-strength Cell Forte' IP-6 & Inositol Powder deliver the same powerful benefits as 16 vegetable capsules. It's time to take serious action toward defending your deep immune health naturally with the powerful protection of Cell Forte IP-6 & Inositol, the leader since 1998. The powerful combination of ingredients in Cell Forte IP-6 & Inositol boosts the body's natural cellular defenses by increasing the levels of inositol phosphates in your cells, which are found naturally in your body and help enhance the immune system. Triumph with the powerful protection of Cell Forte IP-6 & Inositol. 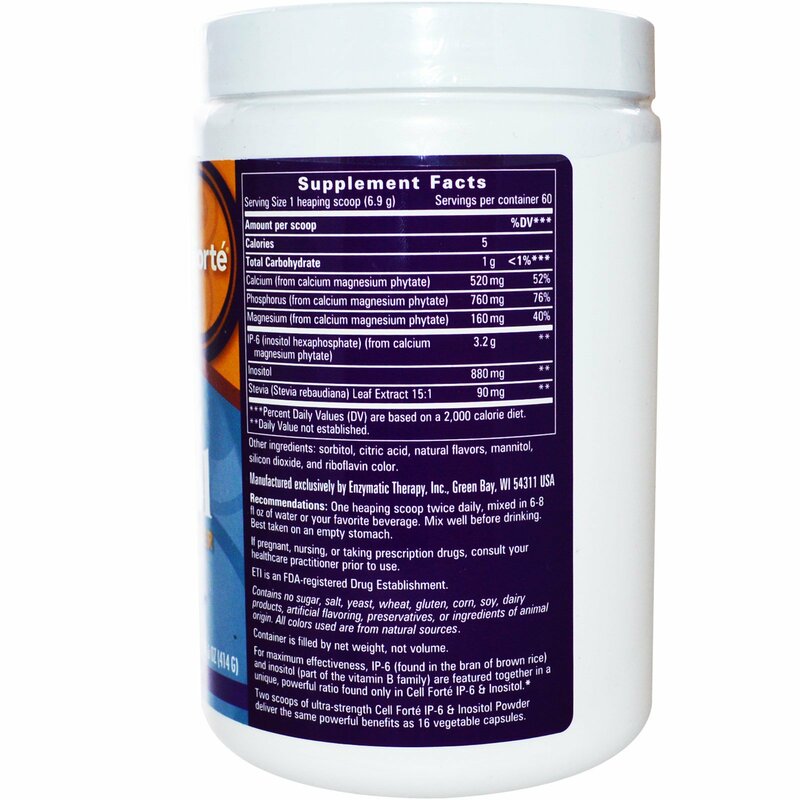 IP-6 plus inositol, as found in Cell Forte IP-6 & Inositol, has been scientifically shown to increase natural killer-cell activity by 58% compared to the control group. Recommendations: One heaping scoop twice daily, mixed in 6-8 fl oz of water of your favorite beverage. Mix well before drinking. Best taken on an empty stomach. Sorbitol, citric acid, natural flavors, mannitol, silicon dioxide, and riboflavin color. Container is filled by net weight, not volume.